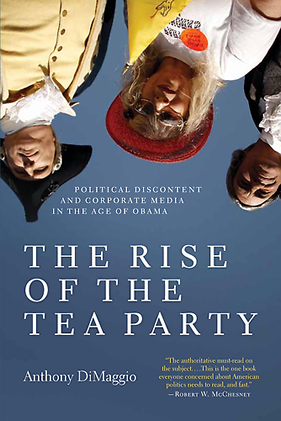 The Tea Party in the United States is not an authentic populist movement of opposition to the bureaucracy of the state and is instead an expression of the right-wing shifts within the Republican Party, according to a new book. Review by Phil Sharpe. The major tasks of the Tea Party, launched as a movement in 2009, seem to be about influencing the process of electing right-wing Republican members of the House of Representatives and the Senate. In this regard they have been relatively successful and some people have been elected to Congress as Republican supporters of the Tea Party. What this shows is that the Tea Party is supportive of the hegemony of big business and advocates a free market ideology. Some, however, have suggested that it is a type of radical populism because it is prepared to exploit popular anger with the Washington establishment in the context of economic crisis. The character of the Tea Party is revealed by the fact that its major support comes from affluent and high income groups within American society. The view that it represents a popular rebellion of blue collar workers is largely a myth. Indeed it would be surprising if the Tea Party did become popular with many working people because its major campaign issue is opposition to the reform of the health service and it is also consistently against the interests of the trade unions. In sociological terms, DiMaggio has provided a powerful understanding of the Tea Party. But what he does not explain satisfactorily is the ideological character of the ideas of the Tea Party. For example, how are they able to appear credible despite the propagation of the ludicrous idea that Obama is a socialist? These types of questions are not answered because the author is content to consider them as a unserious expressions of propaganda that is meant to confuse the general public. This omission is serious because the author is effectively ignoring the relation between ideas and the possibility of the development of mass support. Instead of addressing these issues, DiMaggio is content to suggest that the Tea Party is effectively an artificial product of sympathetic media coverage. That the Tea Party has had uncritical support from some sections of the media is undoubtedly the case. But it could not retain support if its ideas were not considered relevant by some sections of the American population. This point deserves investigation, but it is neglected by the author because of his emphasis on the development of the Tea Party as an expression of the role of the media. DiMaggio analyses whether the Tea Party constitutes a genuine mass movement, which is one that is characterised by its ability for collective action and consistent participation of its members in the decisions of the organisation. This is expressed by the ability to hold public meetings and rallies, and to produce literature. This is contrasted with so-called Astroturf organisations that are extremely centralised and hierarchical, being based on the role of the internet rather than regular internal and external meetings. The Tea Party conforms to the concept of Astroturf organisation. It has an extremely individualist ideology that discourages and opposes collective activity, and this is reflected in its low level of local activity and the fact that the meetings that do take place are poorly attended. Local organisations are completely controlled by an elite leadership. The organisation lacks any semblance of democracy, accountability and expression of local initiative. “In short, the contrast between bottom-up social networking and activism on the left and top-down partisan electioneering and PR on the right could not have been starker. Tea party supporters were unwilling to participate in grassroots organizing, let alone engage in direct confrontation, civil disobedience, or nonviolent direct action,” says DiMaggio. The outcome of the situation is the development of an elite organisation that is compatible with the politics of the Republican Party. It cannot be characterised as an expression of genuine mass protest against the politics of Washington. Instead, its most important success was in influencing the Republican Party to oppose the bank bailouts and other measures of state intervention to try to overcome the economic crisis. They also had a high profile in opposing health service reform. Hence what could be suggested is that the Tea Party is a distinct part of the right-wing of the Republican Party, and is the most vehement supporters of a market ideology. However, they do not form a distinct party within the party and their voting patterns in Congress are not necessarily dissimilar to other Republicans. The outsider image is a myth created by the media. Reluctantly the author admits that the Tea Party has a political programme of support for balanced budgets and opposition to deficit financing, the view that taxes are oppressive, and opposition to what they call the socialist transformation of society. They are also opposed to welfare programmes like medicare and social security. Blame is projected onto Obama for the economic crisis, and the fact that chronic problems occurred in the period of the Bush regime is ignored. DiMaggio argues that this standpoint is irrational and the expression of ideological ignorance that is unable to understand and recognise the character of the economic crisis of capitalism. It also represents a big business agenda that is not genuine populist. What is not explained is why such ideas become credible in this period of crisis despite being expressions of prejudice and irrationality? DiMaggio implies that we cannot take such ideas seriously, but this superficial approach does not establish the superiority of ideas that argue for the alternative of socialism. This is the task that DiMaggio fails to realise. How does DiMaggio explain the apparent contradiction between the apparent ideological limitations of the Tea party in relation to its ability to develop popular support? His answer is that sympathetic coverage from the media provided the Tea Party with effective free publicity. Fox News became the major supporter of the Tea Party within the media. This meant the Tea party was provided with credibility that enabled it to mobilise voters to support the Republicans in the mid-term 2010 elections. This success was also related to the continuation of the country’s economic problems and the fact that Obama was blamed for this situation. The overall result of the actions of the Tea Party was to convince affluent voters that they should support the Republican Party. People with low incomes and traditional supporters of the Democratic Party were not generally receptive to the propaganda of the Tea Party, except on the issue of health care reform. The propaganda of the Tea Party on the issue of health care reform was successful in convincing people that increased public provision was detrimental to their interests. This stance of the Tea Party was compatible with the attitude of the Republican Party and it resulted in the dilution of the legislation introduced by the Obama administration and the effective withdrawal of the proposed policy of public option, or universal medical care. Sarah Palin, a supporter of the Tea Party, argued that the increased influence of the state in the provision of health care would result in death panels, or the introduction of compulsory euthanasia for the elderly. The overall effect of Tea Party propaganda was to create confusion and anxiety about the future of health care. But it is also important to recognise that the stance of the Democratic Party itself, which represented increasing lack of interest in principled health service reform, contributed to the public anxiety and scepticism about the measures. It was in this context that the propaganda of the Tea party could be successful. This situation does not mean that the Tea Party succeeded in gaining the support of poor working class people on an important social issue. Instead the limitations of the Democratic Party seemed to vindicate the propaganda of the Tea Party and led to support for the view that the proposed health service changes might be detrimental for the general public. It is important to understand that the position of the Tea Party was not motivated by the desire to protect the interests of the recipients of health care service, and instead their views were based on protection of the status quo and the privileges of the providers of private insurance. The elite character of the Tea party was shown by the fact that it was unable to organise its proposed conference in October 2010. Furthermore, the Tea Party in Congress failed to act as a distinct pressure group, and instead it merged into the activity of the Republican Party. It had achieved its objective of shifting the Republican Party to the right and so the necessity of the continuation of the Tea party was effectively called into question. In general terms the author has outlined the reasons why the Tea Party does not represent the development of a genuine mass movement of protest against the establishment. It is not a populist organisation in the radical tradition of American politics. Despite this powerful analysis, however, it lacks a coherent analysis of why the ideology of the Tea Party has been able to obtain popular support.